We brought Obi home September 24th, 2018 and now we can divide our life into before Obi and after Obi. It’s been a wild 3-month ride so far and just promises to get better. Here are some highlights and lessons learned so far. The first week was a pretty comical adventure that reminded me a lot of this commercial. Although we had ‘prepared’ as much as we could, you’re never really prepared. The car ride home was fraught with worry about finding just the right out-of-the-way spot for our unvaccinated puppy to potty. The ground, which I had never given much thought to before, now seemed riddled with Parvovirus. We made it home after a 5-hour drive and got Obi into his new puppy pen. Right away, he encountered our orange cat, Oz. They sniffed noses. Oz was unimpressed and has continued his nonchalant attitude about the new family member. Xander is warming up v…e…r…y slowly and prefers to keep his distance unless Obi is sleeping or very relaxed. For the first week, we were totally overwhelmed. We spent a lot of time worrying about potty accidents (there were very few), worrying about puppy biting (the Land Shark thing is real) and calling our breeder literally every day to see if we had broken him. Carla, our breeder was an absolutely brilliant resource and saved us so much stress and worry, along with co-breeders Sam, Gaelyn and Sarah. I’m happy to report that our call frequency reduced, but we still don’ t hesitate to reach out when we’re struggling with an issue. 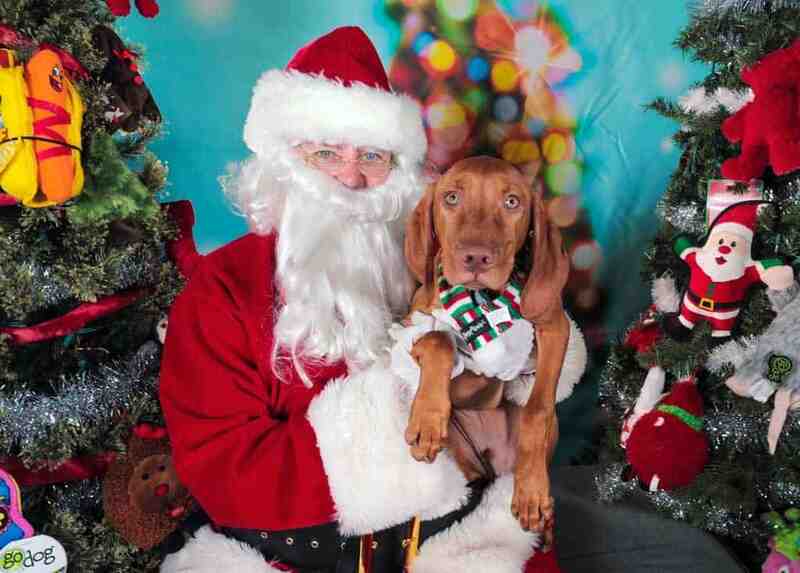 Most people don’t recommend getting a Vizsla as your first puppy and it’s true we went from zero to hard mode, but a lot of research, planning, and thought went into our decision. We’ve pretty much rearranged our lives around being able to give Obi the best puppyhood possible, introducing him to lots of awesome new things and teaching him how to be well-behaved. Here are some of the resources that have helped us navigate these first few months. Zak George is the most pupular dog training channel on YouTube and all of his videos are completely free. You can also buy his book Dog Training Revolution, which gives more detail and references specific videos for different issues and training scenarios. What I love about Zak’s videos is his unbridled enthusiasm and clear philosophy. There’s a dog in every video and he demonstrates his techniques with a wide variety of dogs of different breeds and ages. Ian Stone of Simpawtico Dog Training also has a thriving YouTube channel. The production value of his videos is super high and he has a very science-based teaching style that is informative and gives great context for why he tells you to do things a certain way. One thing I think Ian excels at that Zak ignores is how to deal with puppy biting in a way that actually teaches your pup to inhibit their bite with humans, instead of just redirecting them. Only redirecting puppy biting in humans might solve the problem, but doesn’t teach them that humans are fragile. You don’t want a toddler stepping on the tail of an adult dog that hasn’t developed bite inhibition with humans. Also, having a dog that doesn’t bite your finger off every time you want to give a treat is a real pleasure. If you’re only going to spend money on one online dog training course, I highly recommend the courses from Absolute Dogs. Tom and Lauren are British based trainers (Tom is also a Vet). They teach behaviors through games and their style and philosophies are unlike anything I’ve ever encountered– and I read dog training books for fun as a kid. Note: At the time of this writing, the Black Box Training with all their training courses is 83% off until New Year’s day. Tom and Lauren have a game for every sort of behavior you might want to encourage or avoid in your dog. Best of all, the games strengthen your relationship with your dog which makes them want to work for you and makes things like recall, loose leash walking and dog sports much easier to train. If you have a show dog, or you just want a better understanding of the development of puppies and how to socialize them into well-adjusted adult dogs, this is a great course. If you’re in the Portland area, we highly recommend Wonder Puppy. They focus almost entirely on training and socializing puppies from 8 – 20 weeks. They offer puppy socials, training classes and puppy day camp which is an upgrade from daycare and includes structured play, rest, and training time. Not cheap, but definitely worth it. 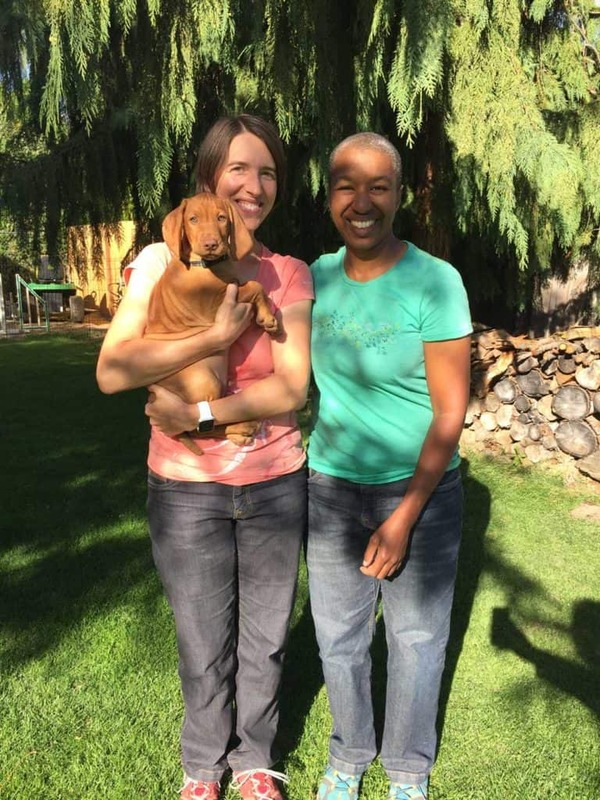 We’ve had our favorite Wonder Puppy trainer Kira over for a couple of private training sessions that were super helpful in helping us deal with some intense puppy biting and lunging issues. Just watching how unfazed she was by his antics helped me find the emotional balance to deal with what can be disturbing behaviors without getting so stressed. 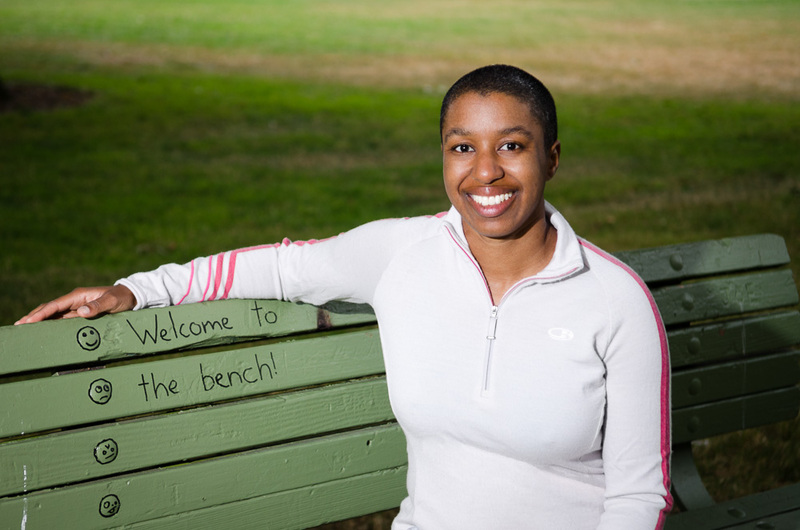 Kira has a YouTube channel with a few videos she’s made for clients to help them resolve specific issues. If you’re not in Portland, definitely seek out a company in your area that has structured puppy play. A well-behaved dog and a well-trained dog are not the same thing. If you focus only on training (sit/stay etc), you could end up with a dog who sits when you tell them to, but is a total spaz, chews all your stuff and is a pain to be around. Teach vital concepts like impulse control and calmness. A calm dog will almost always choose an appropriate behavior if given proper boundaries. Speaking of boundaries, start with lots of them and prevent mistakes then slowly give more freedom as they earn it with good behavior. We’ve made sure Obi is addicted to toys, knows which ones are his and 85% of the time, he’ll choose his toys and bed over something he’s not supposed to get into. 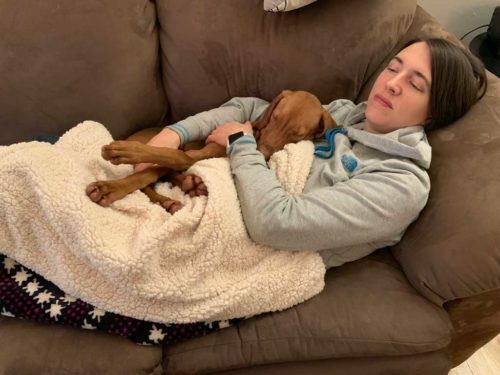 Vizslas are a high energy breed, so we spend a lot of time actively teaching Obi how to relax and calm himself down. 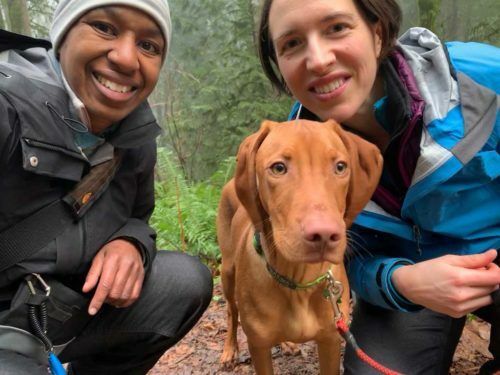 Your mileage may vary, but you don’t have to accept as gospel that your Vizsla (or Border Collie or any other high drive dog), has to run 4 hours a day to be happy. Dogs can sleep up to 20 hours a day. Sure we do cool things like go hike in the snow, but we also spend hours on the couch binge watching Switched at Birth (What? It’s a good show!). Focus on relationship building over training. A dog that is over the moon for you will want to work for you and will be much easier to train. Given what I know now, I think we probably would have given Obi couch privileges sooner and spent more time cuddling. Because of the set up of our house and yard, we have a LOT of restrictions and boundaries early on and the relationship building suffered a bit. Why didn’t we give couch privileges sooner? Couch dogs are snuggly dogs. Oz – This is still my house. On that note… you’ll make mistakes. Lots of them. Chances are very small that any of them will ‘ruin’ your dog unless you ignore something fundamental like socializing and bite inhibition. For most things, you’ll try something, realize it wasn’t the best idea, and then course correct. That’s the job. Your dog is forgiving and even though prevention is easier, you can undo bad habits, especially with a young puppy. Take breaks. What people don’t tell you is that raising a puppy well is a lot like raising a human child in terms of the work and commitment level. Especially if you’re doing it on your own, make sure you have a support group and people who can give you breaks from the constant effort of keeping puppy out of trouble. …and it totally lives up to the hype. Yes, it’s a lot of work, but Obi is an amazing dog and I can’t imagine life without him now. We’re looking forward to watching him grow up and being able to do tons of cool dog sports when he’s older. His parents have a pretty deep roster of titles in things like agility, barn hunt, conformation and from what we’ve seen so far, he could excel at any of those and maybe even dock diving too. 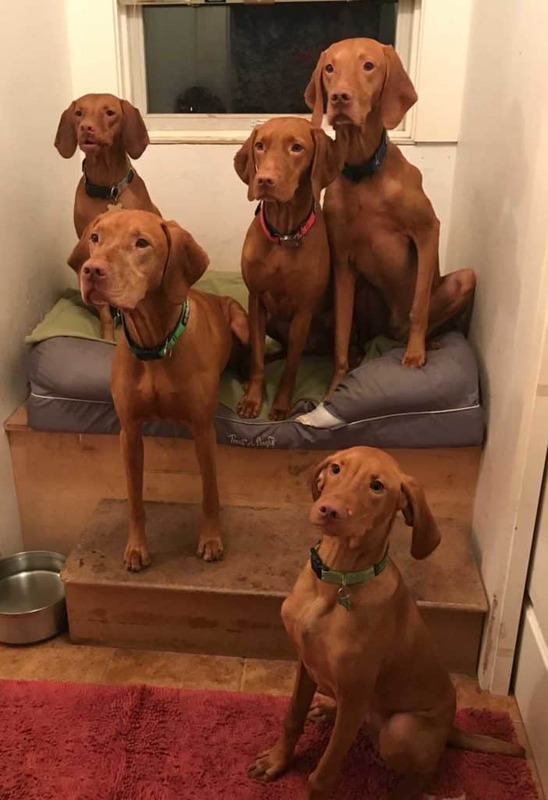 One thing we realized very quickly from this process is that we’ve entered into a small but super friendly and welcoming community of Vizsla-addicts who LOVE the breed and love connecting with and helping each other. 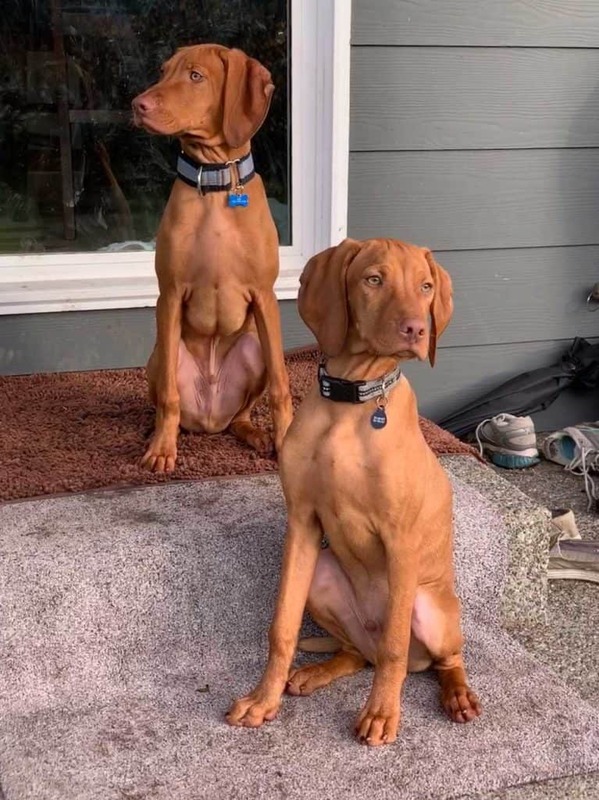 Obi and his brother Cosmo looking handsome af. 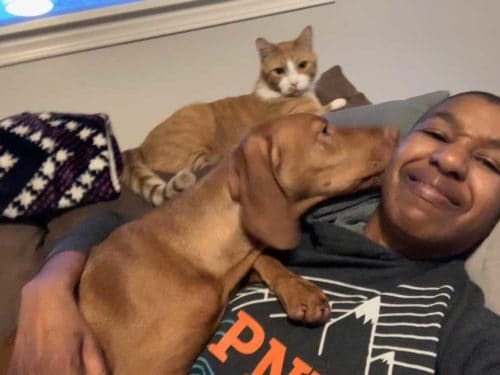 When I was literally crying from exhaustion after being up with a sick puppy for two nights, I was able to call on friends to keep overnight so I could catch up on sleep. 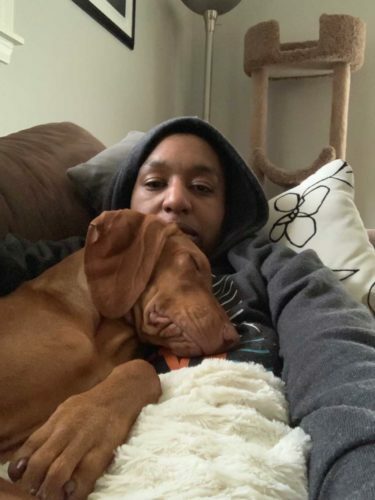 Obi loves hanging with his extended Vizsla family both figurative and literal. Being an only dog, we’re always happy to get him playtime with his buddies. We’re fortunate to live close to Obi’s brother Gravy and they have frequent play dates as well. All in all, it very much feels like our whole lives have been turned upside down in the best way possible. It’s true, life is better with a dog. You can follow Obi on Instagram here. You are doing great and Camp Craig is always here to help! What you also need to mention is that it helps our pack having younger kiddos around. We get, as much as we give. This is an awesome resource. Well done – I love following Obi and look forward to more on his first year. As I’m sure you and Jess know, Obi is a terrific, personality-filled dog. Right cats???? Previous Post: We’re Getting a Puppy!